But booze and fried chicken may not be enough to pull customers into Taco Bell after they read this story. According to the Erie County Health Department, officials visited the establishment after someone complained about the photo of the itchy (or vindictive) employee to the department on Monday. “This is completely unacceptable. Our franchisee took immediate action and has terminated the employee and retrained the entire staff. 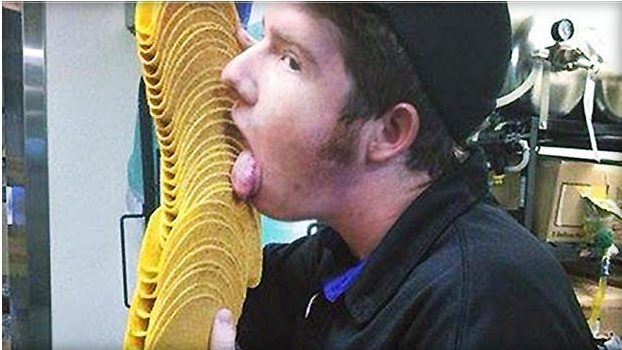 We want customers to know that the person in the photo was never in contact with the food and that the Health Department inspected the restaurant and approved its operations,” Taco Bell said in a statement. Taco Bell said in a statement at the time that it didn’t believe the employees “harmed, or intended to harm anyone.” The company said the shells were being used for training purposes and were not being used for customer orders. The duo was fired, anyway, because, well, no one could say they wouldn’t have licked a customer’s food. Regretfully there are many in society who are maladjusted. When I first met my wife and we had a meal in a restaurant which she complained about and the waitress took it back to the kitchen, which was out of sight of the dining area but, when it was returned, I forbid her to eat it which she could not understand. It is too easy for the chef to interfere with it and it happens. Best to pay for it and make a quick exit. Some chefs are conscientious but others are temperamental and unreliable. It is the same in other walks of life. Security should always start at home; look after number one. Only the paranoid survive. That is very well stated, to bad far too many will not wake up until it’s too late. Everybody trying to convince us that everything is black and white, denying the grey areas of life.